The list of Winter's Tale characters provide a convenient introduction to the William Shakespeare play summary of Winter's Tale. The male and female characters bring the plot of the play to life. Not only do we remember the stories but we remember the people - we all have our favourite characters. The following short summary of Winter's Tale provides a brief description of this famous William Shakespeare play. The story of the plot with its famous characters via the summary of Winter's Tale. Interesting facts and information about the Globe Theatre of Elizabethan London with a William Shakespeare Play Summary of Winter's Tale with a list of Characters. This drama is generally classified as a comedy play by William Shakespeare. However it is also referred to as a 'problem play', because it cannot be easily described as either a tragedy or comedy. The plot story moves between King Leontes' court in Sicilia and Bohemia. The complications arise from King Leontes' and his Queen's friendly attentions to the visiting King of Bohemia. In a trial the Oracle of Delphi declares the queen guiltless but the King still banishes her. Their young son, Mamillius dies of grief but the Queen's newborn baby daughter, Perdita, is rescued from death by a Bohemian shepherd who raises her his daughter. There is a long time lapse of sixteen years between the Queen's banishment and the delayed happy ending which has a few surprises. Interesting Facts and information about the Summary of Winter's Tale and Characters. 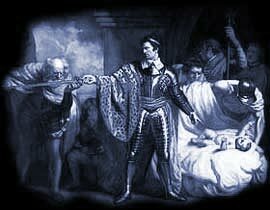 Additional details, facts and information about the Globe Theatre and the summary and characters of other William Shakespeare plays can be accessed via the Globe Theatre Sitemap.